Toro 21 in. 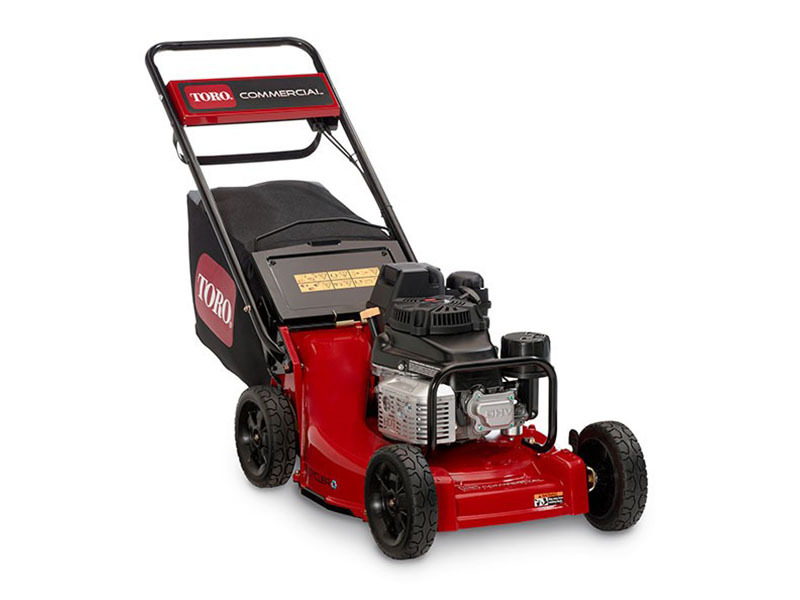 (53 cm) heavy duty commercial walk behind lawn mower with dual action single lever control system, blade brake clutch, 3 speed transmisison, self propel rear wheel drive, commercial grade Kawasaki BBC ZS FJ180V engine. Toro 21 in. (53 cm) heavy duty commercial walk behind lawn mower with dual action single lever control system, blade brake clutch, 3 speed transmisison, self propel rear wheel drive, commercial grade Kawasaki BBC ZS FJ180V engine. The deck is made of corrosion-resistant aluminum alloy, cables are protected with steel cable guards mounted to the handle bar. And a tubular engine guard is attached to the front of the deck for tackling the toughest conditions. It's everything you want in a heavy-duty walk behind. Toro 21 in. (53 cm) heavy duty commercial walk behind lawn mower with dual action single lever control system, blade brake clutch, 3 speed transmisison, self propel rear wheel drive, commercial grade Kawasaki BBC ZS FJ180V engine. RECYCLER CUTTING SYSTEM: This patented cutting system cuts and recuts grass clippings into fine mulch and directs them deep into the turf to provide a "just bagged" appearance.